Feedback: 32 comments - leave yours! 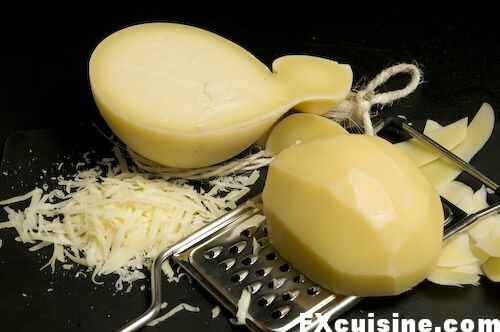 This could be one of the most simple Sicilian pasta recipes were it not for the caciocavallo [catchaw cavALaw] cheese that is so hard to get outside Italy. But if you can find it, pasta alla carrettiera, the cartwheel driver pasta, will drive you straight up to heaven. You don't see caciocavalli for sale very often outside of Italy, so when I saw this one on an Italian stand at my local farmers' market on Saturday, I decided to buy the whole thing. 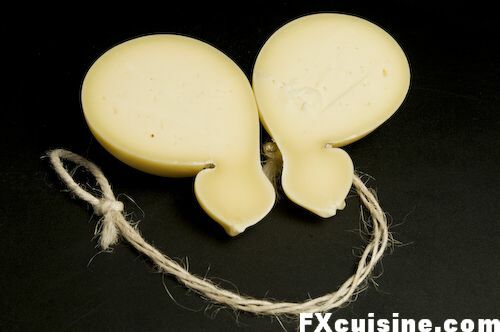 With its obscene shapes (they come by twos hanging on each end of a string), that cheese certainly made an effect. First order of business is to cut it in half lengthwise with the longest unserrated knife you have. 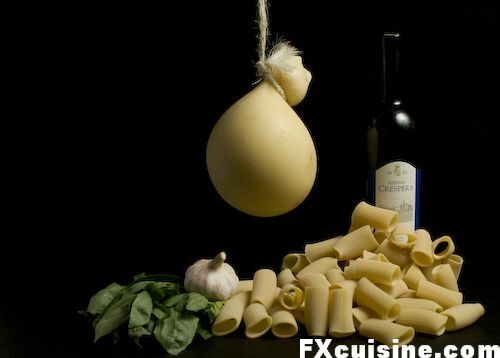 The cheese is a proud member of the mozzarella family, a so called pulled-curd cheese made in the shape of an elephantine tear-drop and then hanged on a stick for a couple month. A real signore of Southern Italian cheeses. 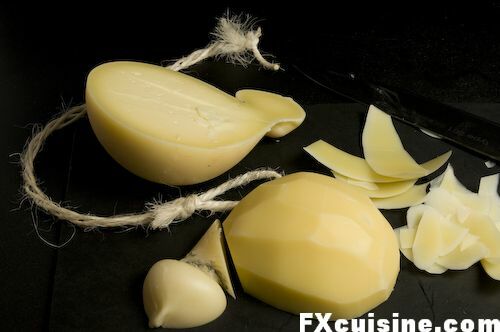 The capo di tutti i capi, the boss of bosses of the caciocavallo family is the caciocavallo podolico, a cheese aged for up to 8 years until it turns red. It has never been seen in public for the last two decaded and I've never seen one. If a reader knows where I can get a caciocacallo podolico I'd be most interested! On with the job now. 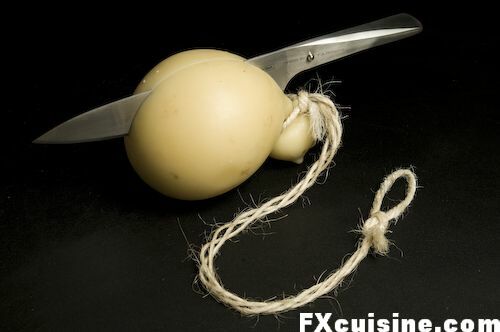 Using your large knife, peel one cheese half. We'll keep the other one with the rind on so that we can store it in the fridge longer. 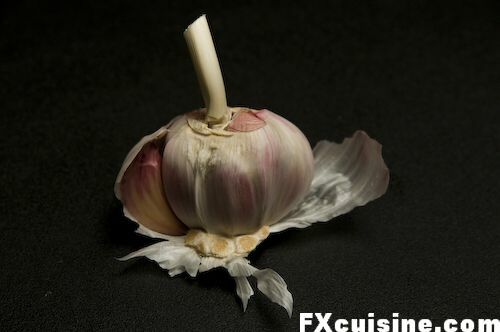 Peel the garlic, remove the green sprout inside and crush. 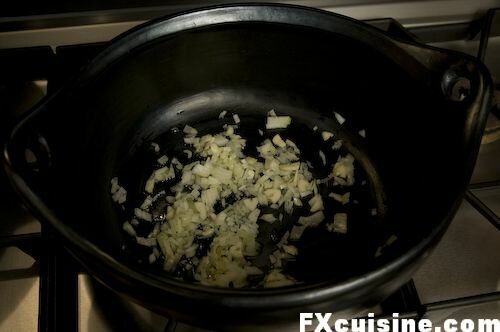 Fry the garlic and onion in a little olive oil on medium high heat. Here I'm using a black La Chamba clay pot, a fine product made in Colombia. Cooking tomato sauces in earthenware is the very traditional way of doing in Italy, although I think the advantages are perhaps not as strong as usually said. But it's a great pot! 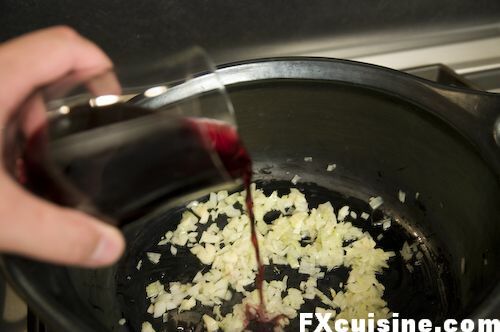 When the onion is soft, deglaze with a drop of any wine you have on hand. In one sharp, self-confident movement, empty a can of chopped tomatoes into the pot. 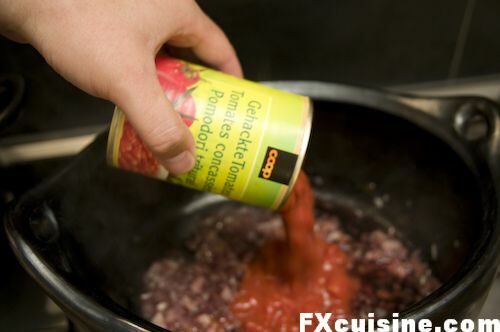 Many cooks are self-conscious about using canned tomatoes. They put the tomatoes in a little bowl and rush to hide the can. But who can really claim he's got access to quality ripe tomatoes all year round? I certainly don't. Even in the height of summer the fresh tomatoes I find taste more like red water baloons than real tomatoes. With the can at least you know what you get. Be shameless about it.